I wasn’t surprised by the numerous cancellations and delays (flagged in red). It was October 30th, a day after Post-Tropical Cyclone Sandy came ashore in New Jersey. But I would not have predicted the alphabetic bias visible in this list, which is sorted by city name. It looks as if the storm spared the early letters of the alphabet and clobbered the later ones. For cities in the alphabetic range from “Atlanta” to “Little Rock,” all but four of 35 flights were operating normally. 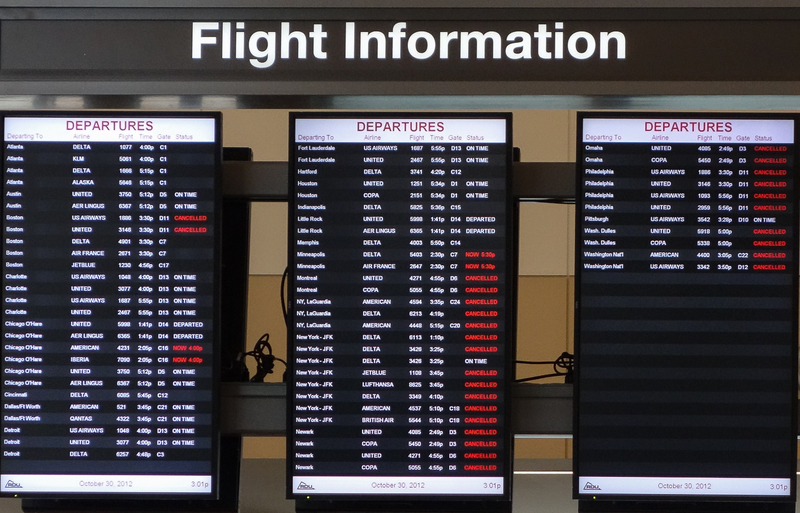 For destinations from “Memphis” to “Washington,” all but three of 31 flights were canceled or delayed. That’s 11 percent versus 90 percent. How fluky is this? Perhaps the proper question is: How unlikely is it that four major cities of the mid-Atlantic region would all have end-of-alphabet names: New York, Newark, Philadelphia, Washington? While, conversely, the early-letter cities served by flights from RDU are all elsewhere: Atlanta, Austin, Boston, Charlotte, Chicago, Cincinnati, Dallas, Detroit, Fort Lauderdale, Hartford, Houston, Indianapolis, Little Rock. Or maybe we should be asking why Minneapolis, Montreal and Omaha, though beyond the reach of Sandy, were also red-tag cities that afternoon. Source code here. Inspiration from Trent and aplweb. This entry was posted in computing, statistics, technology. Worked on google-chrome on Linux 64bit. Also, my android phone works, but is temperamental –it sometimes wants to scroll the around the page instead of the zoom-window, but works generally. It works fine when I view it on bit-player.org (on Chrome under OS X) but does nothing when I view it as I usually do in the mirror of your posts at brianhayes.livejournal.com, I assume because the js is getting stripped out at some stage of the mirroring process. Flight cancellations to unaffected destinations were probably due to the aircraft having been due to fly from, to or through the affected region earlier in the day. Can’t really comment on the alphabetic v geographic distribution of US cities. Works great under Linux Chrome; a bit odd on the Dolphin web browser for Android. With Dolphin, I had to be careful to press and then drag reasonably quickly; if I press and then don’t move my finger quickly enough, it brings up the long-tap menu that offers me choices Save Image/View Image/Set As Wallpaper. (Tapping and then instantly releasing also works — brings up a zoomed image where I tapped.) Also, the zoomed-in image is still not large enough for me to read unless I zoom “normally” as well. But if I do zoom normally, and then use the normal swipe gestures to scroll the page, the image sometimes captures the swipes and moves your zoom window instead of scrolling the whole page. All in all, while it’s possible to use your enhancement under Dolphin for Android, it’s pretty annoying, and readers who are less inclined to experiment might not figure out how to use it at all. At the least, I’d recommend a mini-tutorial in every post where you want to use the technique (something a bit more detailed than “hover with … your finger on touch devices”, which didn’t make sense at all).